The world is changing and evolving every day, and every aspiring business owner needs to keep up with the latest advancements in modern technology in order to stay ahead of the game and maintain a competitive edge over the competition. With so many new inventions and innovations, there are more ways than ever before to boost your business. In the hospitality industry, organizing several large teams of staff in order to complete many different tasks can often be a huge logistical undertaking with a lot of potential pitfalls and problems to avoid and overcome. There are so many things that need to be done, but many small and simple tasks can often be streamlined if you know where to look and choose the right forms of technology. Aiding your staff in even the smallest ways can make a big difference at the end of the day, resulting in better productivity, higher revenue rates, and happier customers, and that's why it can really pay off to keep an eye on the latest technological breakthroughs and invest in new, positive solutions. For the hospitality industry, one of the latest and greatest innovations is Relay from Savioke. Founded in 2013, Savioke is an exciting, innovative company leading the way in robotic engineering and technology. A true pioneer in a field of the future, Savioke's experienced, passionate, highly skilled staff have a proven track record of helping to develop simple, effective, efficient service robots to perform basic tasks. With a huge focus on safety and security, Savioke has consistently excelled at producing robots that can work alongside humans in a state of total harmony, with this brand treating all employees and customers with a lot of respect and care. Contributing to the Robot Operating System (ROS) and helping to support the Open Source Robotics Foundation, Savioke is setting a standard for other robotics companies to live up to, with the Relay being one of the brand's finest creations so far. Designed with the hospitality industry in mind, the Relay from Savioke is a full service robot equipped with all the tech and sensors required to reliably perform room deliveries of food, drinks, and more in hotels. Fully safe and dependable, Relay can put a smile on the faces of your guests, aid your staff by taking care of simple tasks to give them more time to focus on other duties, and increase revenue overall by raising productivity levels. Standing at just a few feet in height, Relay is an ergonomically and aesthetically sound service robot, able to effortlessly glide along various surfaces and navigate all kinds of spaces, as well as being able to use elevators and make its way through crowds of people in busy hotel laptops, corridors, or dining areas. 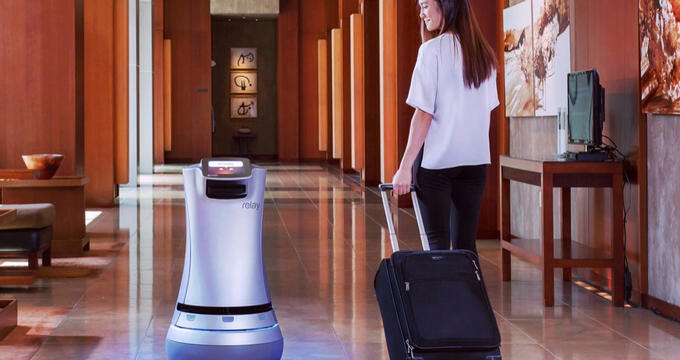 Safely and smartly getting to its destinations in a timely fashion, Relay is able to deliver all kinds of products to hotel guests, who are always thrilled to open the door and see a little robot waiting to greet them. The customer service side of Relay is one of the biggest advantages hotel managers have reported when using this particular robot. Service robots like Relay will undoubtedly be a big part of society in the future, but they remain a relative novelty for now. So, when guests are able to open their hotel room doors and collect their food and drink items directly from a service robot, they tend to thoroughly enjoy the experience and are actually much more likely to recommend the hotel to their friends and return for another visit in the future. Statistics have consistently proven that hotels making use of Relay by Savioke get better social media engagement and higher review ratings from guests, with many of those reviews directly mentioning Relay as one of the main highlights of their stay. With great review scores comes a better reputation, leading to higher RevPAR and better occupancy numbers. In short, Relay can actually help to make your hotel more popular and boost revenue simply by roaming the halls and delivering items like linen and bottled water to your guests. This little bot might is only a simple and small investment compared to the incredible rewards it has to offer.